The September 19th-24th auction series of David Feldman saw some astonishing prices throughout the sale, none more so than in their section of GB. The star of the show undoubtedly being the cover with the block of four 1d red with “Treasury Roulette” experimental perforation selling for €50’000+20%. However I was more interested in these humble Jubilee pieces. Not necessarily one of the top 3 Jubilee items this month, but certainly bargain of the month. 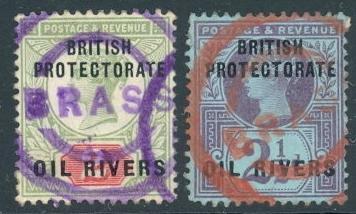 The 4 1/2d on parcel piece is pretty scarce, especially in such fine condition. In fact this stamp was issued primarily to pay this parcel post rate. It sold for only £15.90, and is worth £30-£40 of anybody’s money. Controls of the 1/2d vermilion are still very popular. 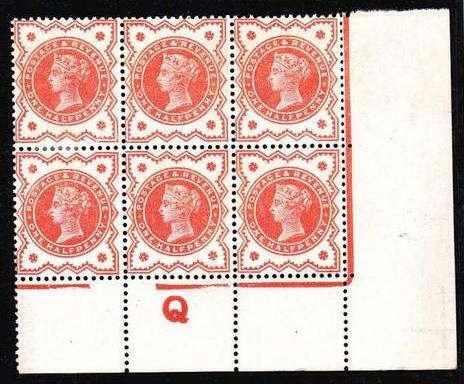 Even though the Q control is probably the most common, this unmounted mint block of six shows a dramatic break to the frame line which makes it a much more collectable item, and it sold for £43.56. I am currently in the process of recording the different settings of each control letter. And finally this large multiple of the Army Official 1/2d green with control number is quite scarce, and was a snip at only £42.74. Controls on the official issues are particularly scarce, although are more common on the Army Official than the others. 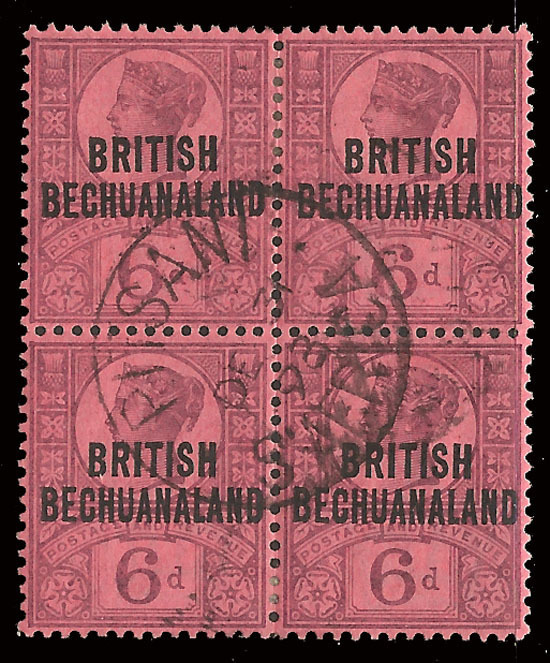 Next up is this attractive British Bechuanaland 6d purple on rose block of four cancelled with a single central Pitsani cds. The buyer snapped this up for only $37.90. If I had seen this item before it had finished I would have certainly bid more than that. Not too long afterwards, it was on Deverrell MacGregor’s website for £55, and sold very quickly. 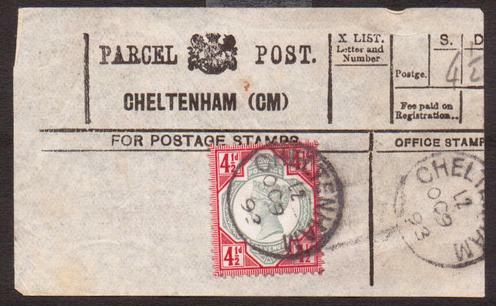 This high franking on a parcel post label sold for £119.50. 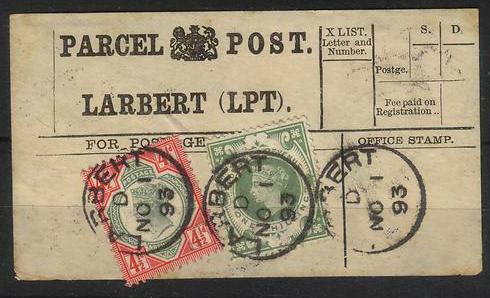 It bears a 1s green and a 4 1/2d green & carmine, both of which are scarce as singles on parcel labels, so it was no surprise it fetched a good price. Parcel labels are very collectable. This superb Bechuanaland cover is definitely the star eBay item of the month, and probably the year. This registered envelope is franked with no less than 27 stamps worth a total of 5s!! Eight different bidders bid seventeen times to try and take this item home, and unfortunately the usual last minute bidding took the price beyond what I was willing to pay for it, and it fetched £339.50. The philatelic nature of the cover put me off bidding higher, but it is still an outstanding Jubilee and Bechuanaland cover. This cover definitely wins the title as “Most Unassuming Cover”, but look closer and you’ll see that it’s a little gem. Sold for a measly £4.20 (I am still kicking myself for forgetting to bid), it has been franked with four 1/2d vermilions. However, I assume that the registration label at the very top left was mistakenly applied, and was partially torn off by the sender before dropping it in the post box. 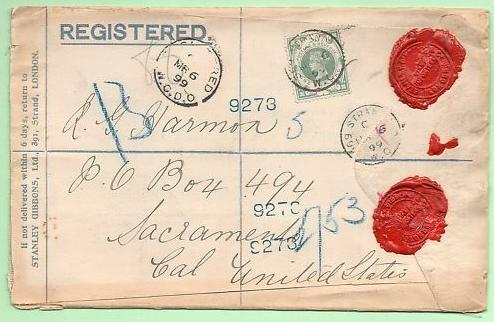 The post clerk having seen this, has still assumed that the letter is intended to be sent registered. So not only is the franking insufficient, but the sending of registered letters was only allowed over the post office counter, hence the manuscript “Posted out of course” and the 6d worth of postage dues. 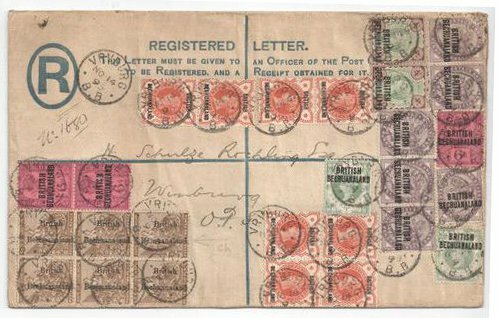 Take another look, and you’ll notice that the stamps are cancelled in Torquay in 1916, and the post clerk has deemed them as an illegitimate franking and placed crosses next to the stamps. Hence explaining the 6d fine. A great little cover with a great story to tell. 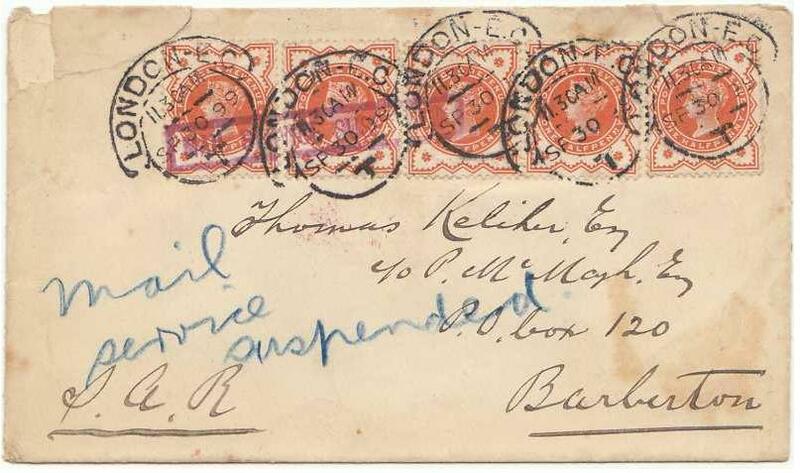 This cover was sent from London to Barberton (South Africa) during the Boer war, and although the condition is slightly poor (as is often the case with Boer War material), the violet “MAIL SERVICE SUSPENDED” handstamp excited collectors enough to see this reach £83.87. 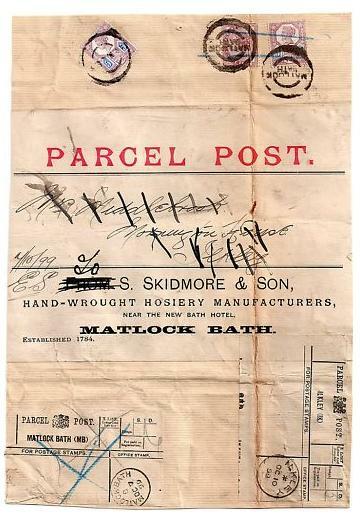 This wonderful parcel post piece was sent from Matlock Bath to Ilkley, before being returned to the sender. The piece not only bears both the parcel post labels of Matlock Bath and Ilkley, but also the frankings for both sendings! 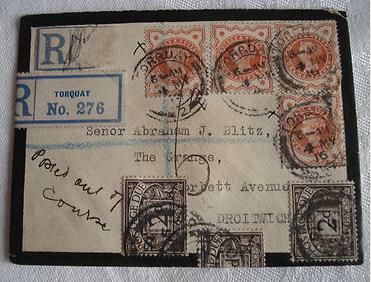 A very interesting item from an increasing popular philatelic subject, it sold for £135.45. 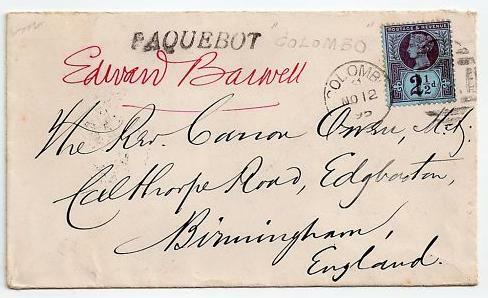 This unusual cover was posted onboard RMS Orizaba, and was put into the mail at Colombo, Ceylon, resulting in the 2 1/2d purple on blue being tied by a Colombo duplex, with “PAQUEBOT” hs alongside. It sold for £73.55. 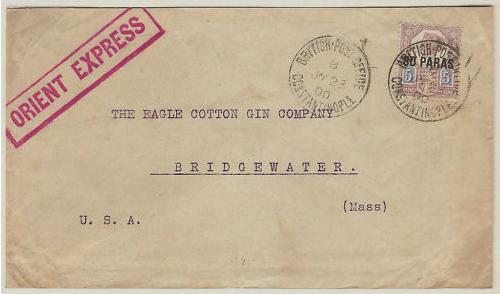 This 1s green as a single franking on cover is quite scarce. However, what makes it more interesting is that it is on a privately printed registered envelope from Stanley Gibbons, along with two of their red wax seals. If I’d had noticed this at the time I would have been more interested, but it fetched a good price at £72.96. 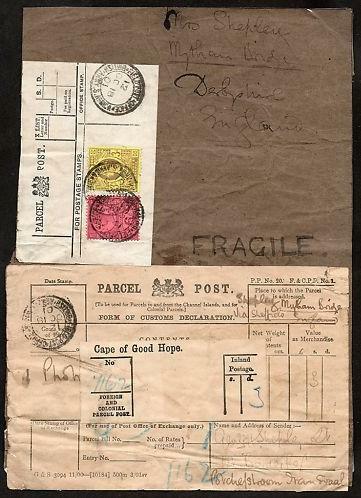 This large piece is unusual not only because it was sent from South Africa during the Boer War, but because it also has the customs declaration form alongside which is the first time I’d seen this before. It bears a 3d and 6d Jubilee tied by a “FIELDPOST OFFICE / BRITISH FORCES S. AFRICA” cds. Strong competition saw this fetch £178.45. 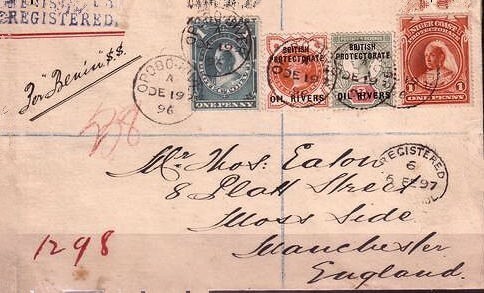 The past couple of months has seen one vendor put up a wonderful collection of cancellations and covers from Niger Coast and the British Levant. This unassuming pair are cancelled by the rubber parcel cancellation of Brass (in violet on the 2d and red on the 2 1/2d). Not only are they scarce cancels, but they’re also very attractive, and fetched £87.00. 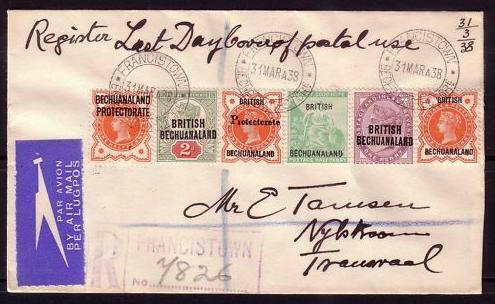 This cover from Bechuanaland in endorsed “Last Day Cover of postal use”, and bears six Queen Victoria issues tied by a Francistown 31 MAR 38 cds, over 40 years after their issue. I have yet to find out if this actually the last date of legal use. Obviously philatelically inspired, it is not unique, as I bought one several months ago for $80. This one sold for $141.00. 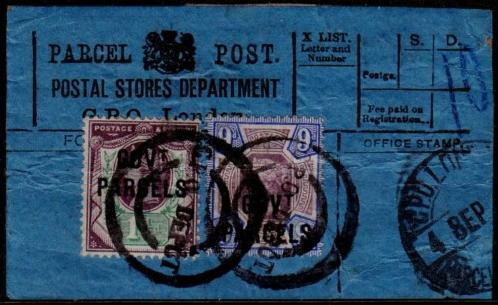 This parcel post label bears a 1 1/2d and 9d Jubilee issue with the “GOVT PARCELS” overprint and is very scarce as such. The creasing slightly lets this one down, but considering its scarcity, it was a good buy at £82.00. The British Levant 80pa on 5d is quite difficult to find on cover, with the 40pa on 2 1/2d being much more common. However, what differentiates this on is the “ORIENT EXPRESS” handstamp. The rarest covers from the British Levant bear stamp-like labels for the Orient Express, but this is the first time that I have seen this cachet, although I presume it to be privately made. Bidding reached £68.00 on this one.